In other words: a lot has been going on in the Starling repository. It's high time to get all those new features in your hands! Thus, I've prepared a new release candidate for you, and I need as many users as possible to try it out! 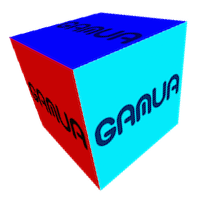 Those of you who are following the Gamua blog might have seen an overview about the new version already (see Sprite3D and What's Next), but I want to give you a little more details in this post. To modify the details of the 3D perspective, use the new properties on the Starling stage, namely "fieldOfView", "focalLength" and "projectionOffset". transformationMatrix3D:Matrix3D — The 3D transformation matrix of the object relative to its parent. is3D:Boolean — Indicates if this object or any of its parents is a 'Sprite3D' object. getTransformationMatrix3D():Matrix3D — Creates a 3D matrix that represents the transformation from the local coordinate system to another. globalToLocal3D():Vector3D — Transforms a point from global (stage) coordinates to the 3D local coordinate system. local3DToGlobal():Point — Transforms a 3D point from the local coordinate system to global (stage) coordinates. This gives you all the tools you should need to create whatever you have in mind. I'm looking forward to what you come up with! If you need some help getting started, I created a small Video Tutorial (accompanied by a GitHub project) that shows you how to use that feature. The AssetManager now loads multiple assets in parallel. Even if you load your assets from disk, this will make the process much faster than before! Expect to have your assets ready in less than 50% of the previous time. In other words, the "enqueue" method now remembers the settings you had on the AssetManager at the time you enqueued the asset, and creates the textures accordingly in the "loadQueue" method. Furthermore, the AssetManager now dispatches "IO_ERROR", "PARSE_ERROR" and "SECURITY_ERROR" events if it runs into problems while processing the queue. That should allow you to handle those problems gracefully. * You can finally add a filter to a container that already contains filtered objects. * Thanks to the same change, it's now possible to draw a filtered object to a RenderTexture. * Furthermore, persistent RenderTextures require only 50% of the memory than before (because they could be implemented without double buffering). For those of you who are not using Feathers, I heavily extended the Button class. It now supports custom textures for the "over" and "disabled" states; you can modify the "color" of the textures or add objects to the new "overlay". * The TextField now supports HTML text for TrueType fonts. * Starling has new method "stopFatal", displaying a panic message to the user. There's much more, of course, and it goes without saying that this release contains a huge number of bug fixes. If you're using Git, a simple "pull" on the Starling repository will give you the release candidate. Others can download the complete release as a zip-file (including an updated "starling.swc" file). Last words: I'd appreciate if as many of you as possible could try out this version! As soon as I feel confident that this version is stable, I will publish it as a stable release. If any problems pop up — be it in the new features or with existing ones — I'll fix them ASAP. Thanks Daniel ! Great as usual ! Feathers 2.0.1 should be fully compatible with Starling 1.6 RC. There are a lot of good stuff in there! And this is magic, just the day I'm going to compile the final version of my first game. Hi Daniel, hi everyone! this sounds all great! quick question : has the filter nesting feature and renderTexture improvements anything to do with the new context3D profiles that are only available for desktop - I mean is it ok for mobile too ? Amazing work! Thanks for this. @modegames: Yes, stencil masks are planned for Starling 1.7! @Thomas: that limitation was not tied to any profile — the enhancement works even in constrained mode, if you're using at least AIR/Flash 15. According to Adobe, there might be performance problems on some mobile hardware, but I haven't seen any problems in practice yet. Should this happen, we could blacklist certain hardware and let it fall back to the previous "double-buffering" mode. You can find more information in this Adobe document.